Self defense is not what most people think it is. There's only one goal in self defense, and it isn't to beat up or take out an attacker with martial arts moves. The goal of self defense is to prevent injury to yourself. Most of the time, the vast majority of the time, physical techniques are not the best way to do that. The best way to avoid injury is to prevent an attack from occurring in the first place, to prevent a physical conflict. That way, there is no chance you'll sustain any injury at all. And it's not hard to do. It's far, far easier than physical defense. There is more to prevention than most people realize, but it doesn't take long to learn, and the good news is, everyone can do it. If you want to know how, my prevention page will give you everything you need. Where Do Martial Arts Fit In? In a worst case scenario, you may have to physically defend yourself. But keep in mind, that it will be a worst case scenario. Real violence is fast, dynamic, chaotic, and ugly. It's not something you want to face, for a variety of physical, ethical, and legal reasons. Most martial arts will not prepare you for it. My article, Why Most Martial Arts Don't Work, will shed light on that. If a situation gets so bad that you do need to resort to physical self defense, a limited, stylized martial art may not be of much help. You'll probably be at a disadvantage, attacked by bigger and stronger men, multiple opponents, or armed opponents. You'll need a functional combination of strategy and techniques, backed by a significant amount of solid training, and at least a small dose of luck. You'll find free, comprehensive information, pictures, and videos on all of these areas, here on this site. 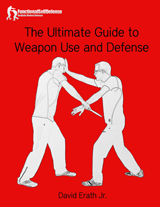 Do you know how to use and defend against sticks, knives, and guns? If you want to be able to physically defend yourself, then you need to. Weapons can give you a tremendous advantage, or when used against you, a similar disadvantage. Because prevention is easy to learn, it should be your primary focus in self defense. Real physical defense is both hard and extremely dangerous. But physical training and martial arts, even if you never have to use them, are great for both physical and mental health, and a great deal of fun. If you're going to train, you might as well train functionally. 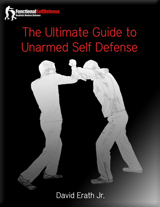 My goal is to provide you with the most comprehensive resource on functional, realistic self defense on the web. In the right sidebar at the top of every page, you'll find links to the major sections of this site, each of which has additional links to relevant pages with even more information, pictures, and videos. Although the self defense and martial arts pages of this site are related and often interlinked, you can learn to physically defend yourself without studying a specific martial art in depth. However, training drills and techniques that can be found in various martial arts are essential for physical defense, and having an elementary understanding of those styles can be helpful. There is no magic in self defense or martial arts. There are no secret or ultimate techniques. And real skill in physical self defense requires not only techniques, but also functional training methods and strategies. You'll find comprehensive information on all of these elements here. If you enter your name and email address below, I'll send you several emails with self defense tips and info, and will let you know when I've made updates to this site. You may also want to check out my blog. You can subscribe to it by email here, so each post gets emailed to you directly. If you have any questions or comments, please feel free to contact me here.